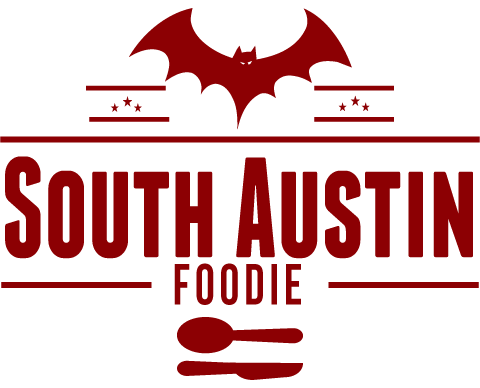 It is my pleasure to present the South Austin restaurant portion of the Austin Food Blogger's Alliance 2012 City Guide. There are tons of places, and these are just some of my favorite spots. Please eat and enjoy! Doc's -- Great bar food and people watching. Perla's -- Upscale seafood spot, including a raw bar; salted butterscotch pot de creme for dessert not to be missed! Previous post. Hopdoddy -- This hoppin' burger spot has given new life to this piece of real estate. The beef burgers are great, but I CAN'T say enough about the lamb (Greek) burger! (Or the salted caramel milkshake.) You may want to think about splitting your food with a friend! Previous post. Home Slice -- NY style pizza, right here in ATX! Props to the owners, in the past, have closed for a week and taken the staff to NY for "research". Be prepared to wait, unless you do the walk-up window. Southside Flying Pizza also worthy. Enoteca/Vespaio -- Enoteca is the neighborhood bistro side, and Vespaio the fine dining, but they share the same kitchen. E will have your delicious pasta, paninis, pizza, V will have these, plus some great meat specials, great date spot. It's hard for me to go to Enoteca and not have the spaghetti carbonara; suppli and calamari too. Previous post on Enoteca. The Woodland -- Brunch is divine, as are the desserts. Previous post. Magnolia Cafe -- One of the few spots in town open 24 hours a day. Bernadette's salad and Martian Landscapes are always favorites. 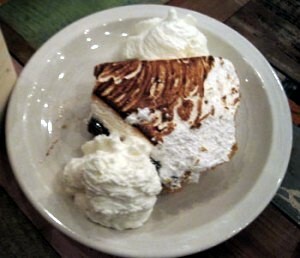 Lucy's Fried Chicken -- Upscale fried chicken and luscious pies, s'more pie below; from the folks at Olivia (at 2218 College Ave, map). Curra's -- (at 614 E. Oltorf, 1/4 mile east of Congress) I much prefer their food to that other spot in the middle of SoCo. Avocado margaritas. Breakfast tacos. Grackles on the patio. Habana -- I feel like I've been eating here for years (and yet, I don't seem to have pictures, ooops!) 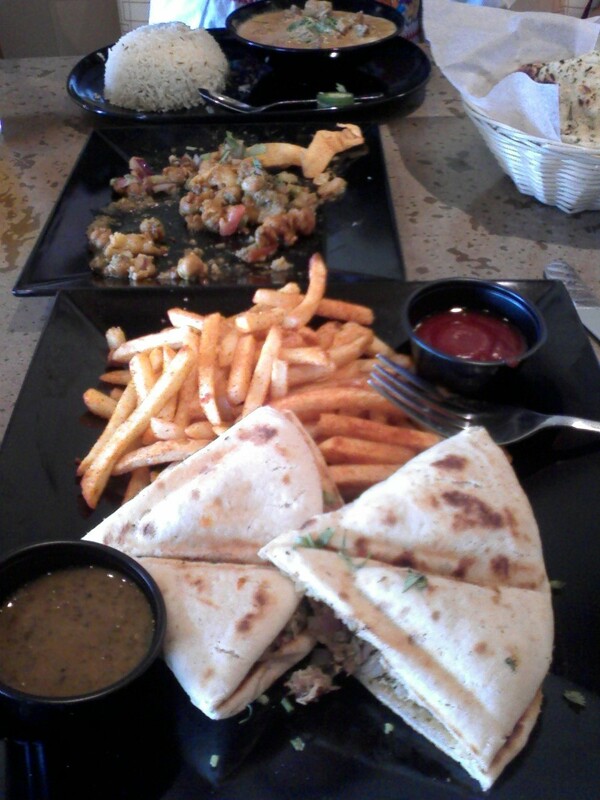 Cuban and Caribbean foods, mojitos and happy hour specials. Love the outdoor cabanas; I am always partial to the pollo salteado. Borrego de Oro -- Bit of a dive, but the interior Mexican food is worth it. Mole. Lamb stew. Previous post. Hill's Cafe -- Great burger, served on a sweet bun. Sweet potato fries too. (Just past Ben White at 4700 S. Congress) Previous post. Whip In -- Part liquor store, part grocery store, part bar/restaurant, they serve food with an Indian influence. Nice patio, live music, you often forget you're on the IH-35 frontage road (1950 S. IH-35, map). Elizabeth Street Cafe -- Barely two months old, but making a mark already. French-inspired Vietnamese food. Pork meatballs are so incredibly tender. Previous post. Lenoir -- Also new to the Bouldin neighborhood, this tiny spot is influenced by "hot weather" foods; previous post. La Patisserie -- Really a French bakery, not a restaurant, but too good not to share! (If they have the toasted almond macaroon, try it -- it was MY suggestion!) Love a warm morning (cinnamon bun) bun for my breakfast; previous post. Bouldin Creek Cafe -- A laid back, vegetarian haven, even us carnivores find tasty things like their veggie burger or enchiladas with "chorizo" and caramelized onions. Sugar Mama's Bakeshop -- Also a bakery, but owned by some great people, and they're in the process of expanding into the space next door. Cupcakes, pies, bars, and soon, breakfast! Green Pastures -- A beautiful old estate, complete with peacocks. Not just for events. The Flying Carpet -- This Moroccan spot started as a food trailer, and they've just "graduated" to a brick and mortar establishment at 504 W. Oltorf, about a block from S. 1st. Maria and Abdu are some of the nicest folks ever, and their food is delicious and made with love -- try the Moroccan burger; previous post. Habanero -- At Oltorf, a hair off the Mexican Mile, this one's my favorite of the South First Mex/Tex Mex places! Great charro beans. Previous post. Casa de Luz -- Just off Lamar, this macrobiotic spot, has legions of faithful devotees, and a community center. Shady Grove -- Probably where I had my first veggie burger many moons ago! 1624 Barton Springs, about 1/4 mile from S. Lamar. Uchi -- Fine dining at some of it's finest. The original of the Tyson Cole empire, fusion Japanese. Wagyu hot rock. Hamachi. Pitchfork roll. Make a reservation; one of my earliest blog posts. Maudie's -- One of several locations around town, good happy hours. Suzi's Chinese Kitchen -- Yes, it's Americanized Chinese food, but it's consistently good. No one does sesame chicken like Suzi's. The Highball -- From the Alamo Drafthouse people, is it a restaurant? A bar? Lounge? Bowling alley? Karoke bar? Yes. The Dr. Pepper ribs are VERY messy! Previous post. Sazon -- Really good interior Mexican food, nice outdoor patio, even if it is sitting directly on Lamar. You don't find huitlacoche just anywhere; previous post. Olivia -- A beautifully designed building, outdoor patio, garden in back, and a solid menu. Dinners and weekend brunch, committed to locally grown as much as possible; previous post. Black Sheep Lodge -- Yeah it's a bar, but it's a bar with great food, like Nathan's corndog bites, and fried pickles. Barley Swine -- One of the spots that has been buzzing ever since they opened last year. Creative seasonal foods, with an emphasis on beer pairings, and a highly knowledgeable wait staff. Community seating, no reservations taken; previous post. Mr. Natural -- Another vegetarian spot (yes, this is SOUTH Austin! ), a combination cafe/store. Hearty, hefty portions. Artz Ribhouse -- My favorite local spot to make a pig run! And the place I often take out of town visitors. I get cravings for their baby back ribs. Previous post. Juicebox/Soup Peddler -- Part of the Austinville 78704 complex at Lamar and Manchaca. You've got soups and smoothies/juices, healthy and tasty, all in one spot. Papalote -- Small little Mexican street foods spot (post), owned by the people of Azul Tequila, good vegetarian options. Phil's/Amy's -- Burgers galore, and yes, THAT Amy's ice cream; previous post. Kerbey Lane -- Another 24 hour spot, Kerbey just move into a new location (3 blocks from the old) with more parking. Gingerbread pancakes. Red's Porch -- A Tex Mex/Southern/Cajun combination -- something for everyone. Great views of the Greenbelt and crowded for happy hours, previous post. Pluckers -- Kind of a sports bar, and decidedly known for their wings, but I like their fried mac 'n cheese! Central Market Westgate Cafe -- Daily specials, family friendly, and live music a couple nights a week. Oh yeah, and then you can shop! Hyde Park Bar and Grill -- Known for their battered and highly addictive french fries! Sap's (formerly Madam Mam's) -- Recent name change, due to a divorce. I eat here frequently enough to know what some of the better dishes are: the tom yum soup, tiger cry, moo ping with pork, amazing green beans. And frequently enough that I should have pics. Next time. Tarka -- Indian, from the previous owners of the Clay Pit downtown. Dine in or carry out; post. Craig O's Pizza -- Yes, it's in a strip center but it's good food, certainly better than the chain restaurants nearby. Pizza, pastas, subs, salad, beer. Yanagi -- Japanese food with great value; lunchtime bento boxes for lunch average $10 and are a LOT of food. 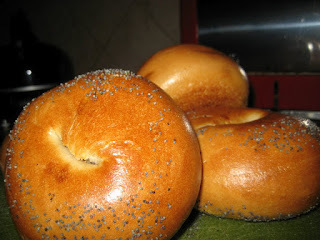 Wholly Bagel -- Big, fat, NY style bagels! 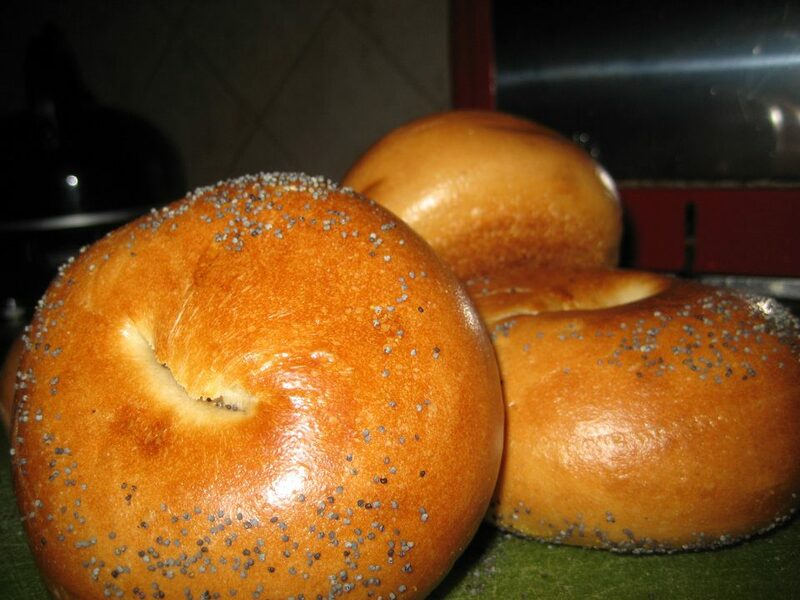 Bialys too! 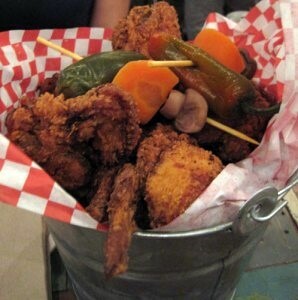 Crusty and tender, all in one. 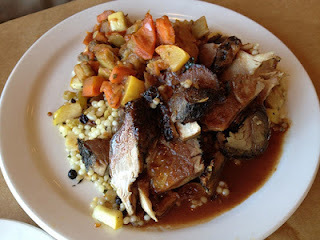 Cafe Malta -- I haven't been yet, but I hear great things, like house roasted pork shoulder over roasted apple couscous and warm ratatouille with a date demi-glace. And they make their own pasta. Galaxy Cafe -- They have a few locations around town now, but this one at Slaughter and Brodie is the original. Soup, salads, sandwiches, family friendly. Map. Evangeline Cafe -- Cajun in deep, south Austin! Po'boys, and tiny little crispy onion rings. Previous post, map. Jack Allen's Kitchen -- On Hwy 71, past the Y in Oak Hill (map), lies a destination in what was once the middle of nowhere, at least restaurant speaking. Lunch, happy hour, dinner, brunch, JAK's has it all! I've got to get there for brunch.... Previous post. What a wonderful and complete list, Suzanna. I really appreciate you stepping up to the plate to draft this at the 11th hour. Really, we should have assigned it to you in the first place. 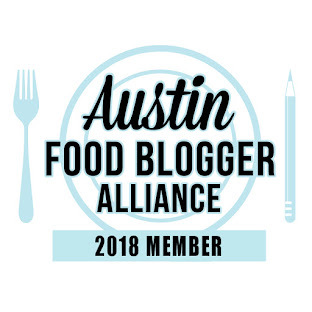 No one knows food in South Austin quite as well as you do! Nice list! FYI Artz is now closed/out of business. Satellite Cafe in Circle C is pretty good, and so is Galaxy Cafe on Brodie near Slaughter. I'll have to look into Satellite, thanks! Satellite is aweful, don't waste your time. After try #6 or so, we gave up on it. Nice blog.Thanks for sharing this blog. I really appreciate you stepping up to the plate to draft.Keep up the good work.Great informative post. I get more information from this. I am delighted to have found this post. Thank you! There's a 2013 guide on my blog too, hope you found that! Cafe Milano on Southwest Parkway is a great choice. Family run. Quiet except for music on the weekends. Excellent pasta and pizza. Love the Albanese (sp?) pizza with extra smoky Albanian sausage. I have browsed most of your posts.This post is probably where I got the most useful information for my research. Thanks for posting, maybe we can see more on this. Even though it's popular to "slam" the big guys, McD's is actually better than P Terry's. This statement is less about Mickey D's being good though and more to say that P Terry's is overrated and downright crummy. Try Mighty Fine on Brodie for a much better burger. Thanks for writing. Please keep an eye out for my annual updated City Guide post, coming within the month.